The Professor and the Madman is a 2019 Drama History Mystery movie directed by . It stars Mel Gibson, Sean Penn, Natalie Dormer, among others. 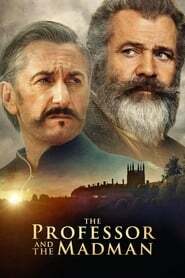 The Professor and the Madman is currently rated 7.4 stars on the ReelBugs scale. "The incredible true story that defined our world." Mel AND Sean in a movie? They finally made a film about it! I like the book & now looking forward to watch this. 1.22 - surprised Mel didn't turn to the camera and give a little wink there. This is a great story for a movie. Oxford! Oxford! Oxford! Finally, the true story behind the creation of the only authoritative dictionary in the English language gets a well-deserved and well-executed cinematic rendition for generations to come to behold and treasure, just as much as we treasure the Oxford dictionary! Learn something, ye stupid Yankees! Buy an Oxford dictionary, abandon your ways of folly and learn the language in its full and original rendition! Enough is enough! Bring back COLOUR to your world! Looks like a great movie and guaranteed flop. Hell of a cast. Eddie Marsan, Jennifer Ehle, Stephen Dillane, Coogan, Penn, and Gibson too? Solid gold. This looks incredible! Cannot wait to see it. Would Anthony Hopkins mould into this movie!!!! Change the title to 'Crazy Beard'. GIBSON I love you and most of what you have done... WHY, WHY share the same air with that POS PENN???? Going to dodge this POS and hope you come to your senses when you accept your next role.